Townsfolk who wanted to improve their complexions by bathing in the May Day dew may have been disappointed as the dew was diluted by heavy overnight rain. 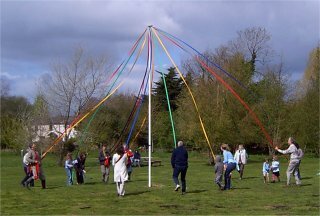 Luckily this had cleared up and sunny, but breezy, periods blessed the Millennium Green's first May Day Celebrations. 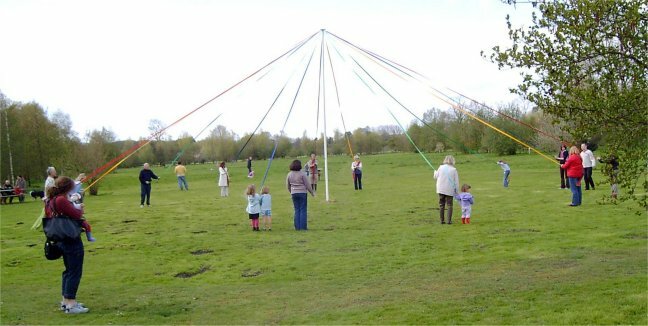 The breeze did not make sorting the ribbons out an easy task but many folk, young and old, with lots of directions from bystanders, arranged the ribbons to allow a musical dance around the Maypole. 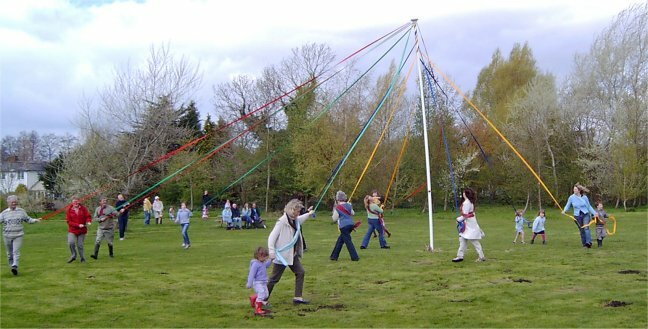 A gentle musical dance to and from the Maypole was followed by a more adventurous one around the Pole (left). 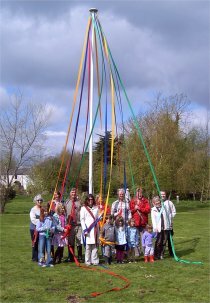 After a short pause to satisfy the world's press (right), the final counter-rotating dance saw the red and green team try, unsuccessfully, to pull the Pole down (below). So, it would appear, another Whitchurch tradition has been born. But before May Day 2007 the Meadow will see at least one more Dog Show (date to be arranged) and the Rude Mechanical Theatre (booked for 13th August). 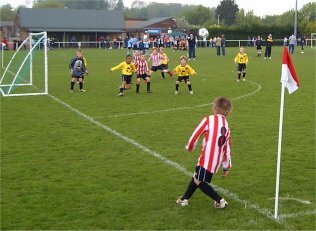 A grand total of 73 local junior football teams from under 8's up to under 13's took part in the Junior 6 a-side competitions run by Whitchurch United. 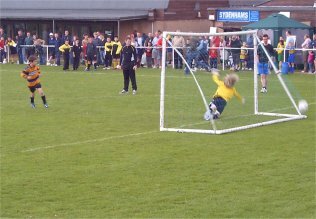 Whitchurch entered 7 teams and reached the semi-finals in the U12 competion and were runners up in both the U11's (on penalties) and U13's. Around 25 runners lined up for the 2nd Annual Fun Run. A collection of serious runners from Overton Harriers with mums, toddlers, prams, dogs and regular joggers made up the field. Organiser Harriet Titcomb reports that there was there was an excellent atmosphere before and after. The serious rain which threatened to dampen entusiasm held off until after the event. 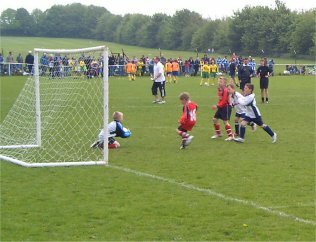 The winner was Ben Riddley from Lynch Hill Park who came in at 19 mins 34 secs, shaving 4mins off his winning time last year. 48% of Whitchurch's electors turn part in the most contested election in Basingstoke and Deane's District Council Elections on 4th May. This is one of the highest in the District and well ahead of the national average. Alison Wall retained her position on the council and is joined by her husband, who replaces Gill Nethercott as the town's other District Councillor. Does anyone know of anybody who has any information regarding the history of the old Orchard and apple store on Bloswood Lane (opposite Bloswood Drive)? The family which has recently finished renovating it would love to find out a little more about its history. Put your information on the Bulletin Board here or email . With work moving on on the old Scout Hut site, the plans showing the 2 story design have now been made available on Basingstoke & Deane's website, press here to see them. The public consultation period for these proposals runs from 11th May to 8th June 2006. The plans are available for viewing in the entrance hall of the Town Hall, during normal opening times, and between 9.00 am and 11.00 am on Saturday 20th May 2006. Whitchurch Town Council is sad to have lost three long-standing members, Gill Nethercott, Iris and Roy Dykes. Their fellow members and the staff would like to thank them for their dedicated and loyal service to the Town. Their retirement leaves three vacancies to be filled. If you are interested in standing for Council, or would like to find out more about these voluntary appointments, please phone Cathy Burt on 01256 892107, or write applying to the Town Clerk, Town Hall, Newbury Street, Whitchurch, Hampshire, RG28 7DW.